Also serving communities of Baldwin Park. There are 169 Assisted Living Facilities in the West Covina area, with 8 in West Covina and 161 nearby. The average cost of assisted living in West Covina is $4,000 per month. This is higher than the national median of $3,346. Cheaper nearby regions include Covina with an average starting cost of $3,195. To help you with your search, browse the 545 reviews below for assisted living facilities in West Covina. On average, consumers rate assisted living in West Covina 4.3 out of 5 stars. Better rated regions include Hacienda Heights with an average rating of 5.0 out of 5 stars. Caring.com has helped thousands of families find high-quality senior care. To speak with one of our Family Advisors about assisted living options and costs in West Covina, call (855) 863-8283. Just 19 miles from Downtown Los Angeles, West Covina is young city, established in 1923. It's population is over 100,000, seniors accounting for 13 percent. The West Covina area is home to eight assisted living facilities. There are an additional 49 facilities in the areas surrounding West Covina. 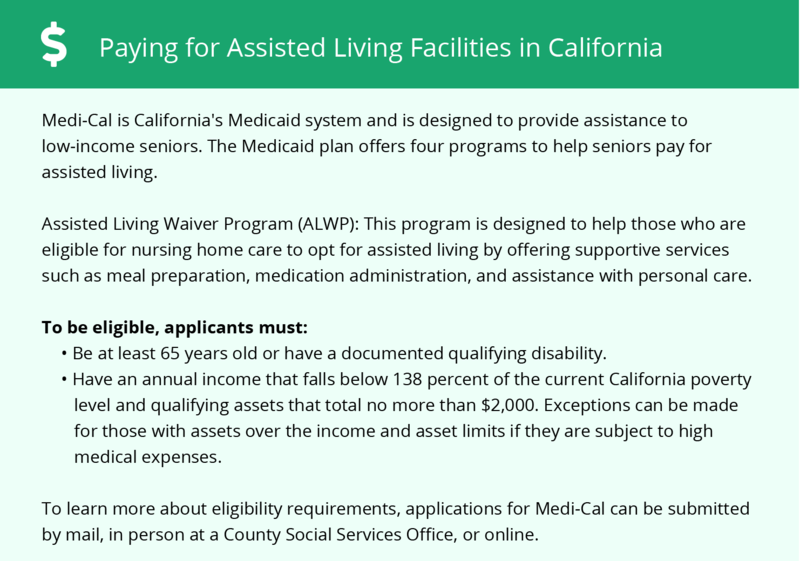 Assisted living facilities, referred to as Residential Care Facilities for the Elderly (RCFEs), are regulated by the state as The California Department of Social Services, Community Care Licensing Division (CCLD) and the Continuing Care Contracts Branch. Pollution is a problem throughout most of Southern California. The American Lung Association give Los Angeles County an air quality rating of F. Seniors with a respiratory illness should consider how this could affect their health. Seniors on a budget should consider the high cost of living in California. West Covina is 48.7 percent more expensive than the rest of the U.S. and just under the state's average. Los Angeles County is a member of the AARP Network of Age-Friendly Communities, meaning that its elected leadership “has made the commitment to actively work toward making their town, city or county a great place for people of all ages,” according to AARP. Seniors and their loved ones may appreciate the low rate of violent crime in West Covina. With a rating of 22.1 out of 100 (1 being the safest), it is nearly 10 points lower than the national average. Property crime, on the other hand, is slightly higher than average. While social security is not taxed, California has some of the highest tax rates in the United States with a state tax of 6.00 percent and a local rate of 1.25 percent, making it potentially difficult for seniors on a tight budget. West Covina is a comfortable place to live. Seniors can enjoy the sunshine 287 days a year and stay active in winter. West Covina has an average January low of 46 degrees and doesn't snow. Assisted Living costs in West Covina start around $4,000 per month on average, which is on par with the average cost of assisted living is $4,000 per month, according to the latest figures from Genworth’s Cost of Care Survey. It’s important to note that assisted living rates in West Covina and the surrounding suburbs can vary widely based on factors such as location, the level of care needed, apartment size and the types of amenities offered at each community. 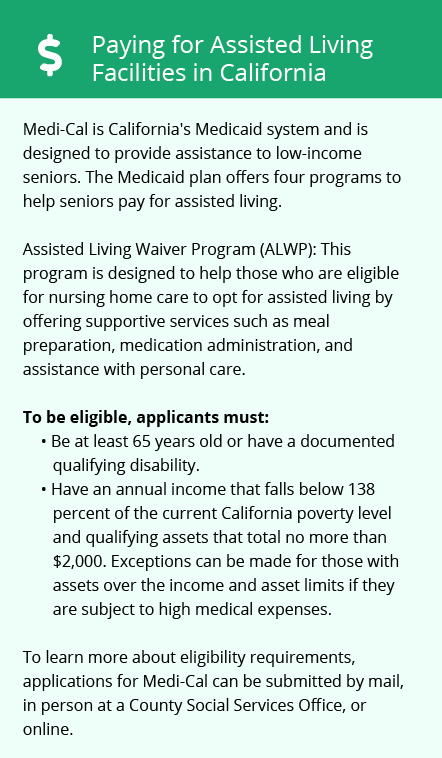 Eligible California seniors can receive help with assisted living costs through Medi-Cal, the states Medicaid plan. Financial aid is also available to qualified individuals through state-funded waiver programs known as Home and Community Based Services (HCBS). West Covina and the surrounding area are home to numerous government agencies and non-profit organizations offering help for seniors searching for or currently residing in an assisted living community. These organizations can also provide assistance in a number of other eldercare services such as geriatric care management, elder law advice, estate planning, finding home care and health and wellness programs. To see a list of free assisted living resources in West Covina, please visit our Assisted Living in California page. West Covina-area assisted living communities must adhere to the comprehensive set of state laws and regulations that all assisted living communities in California are required to follow. Visit our Assisted Living in California page for more information about these laws.